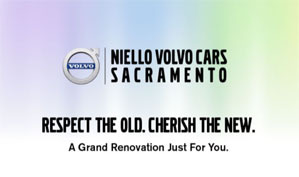 Niello Volvo Cars Sacramento is re-opening the doors on Madison Avenue with a newly renovated showroom, boutique and service lounge. The stylish, sleek and innovative design will make you feel right at home. We invite you to see the store for yourself during our week-long Grand Opening Celebration! Tuesday, June 26th until Saturday, June 30th, our doors are open to introduce you to all that’s new in the world of Volvo. From the newest Volvo products to our luxury showroom, we welcome you to join us on the day that works best for you. We’ll be ready and waiting to welcome you!